The pursuit of great tea, in great tea shops. The Greenhouse is a tea shop with an ethos and a message: to trade ethically and promote environmental matters (hence the green tea puns, see?). Tucked away in a lovely old half-timbered building (and yes, though are solar panels you can see on the roof), just up the road from the characteristic (and soon to be sold off) city fire station, The Greenhouse squeezes a heady environmentally-friendly mix in, as you would expect from an establishment whose slogan is "premium organic produce that doesn't cost the earth". But don't worry, that "premium" doesn't mean that everything here is expensive - on the contrary, this is a bargain tea shop! First off then, let's deal with the tea; I just ordered a tea, plain and simple. Not that I wasn't spoiled for choice with a chalkboard menu that offered rooibos, breakfast tea, Darjeeling, Earl Grey, Assam, chai, camomile, fennel and fruit teas. From what I was served, the breakfast tea is the default. It was served in a big mug that bore the slogan "Reforest the Earth". The tea-bag was left in which, for me, was a nice touch. And I'm happy to report that it was the best cup of tea I've had this year. If I'd wanted, I could have had it with soya milk too, rather than the dairy norm - a nice touch that you don't often see. And what of the wider menu? Well, as you'd expect it's predominantly organic and vegetarian. There's plenty on offer too, from snacks to heartier meals: sandwiches, soup, jacket potatoes, salads, ploughman's, and home-made pasties (served cold). The best thing to go with your tea though is one of the selection of delicious home-made cakes - I had Rose's Lemon Drizzle Cake with my cuppa, and it was excellent. Many of the cakes bear the name of their respective creator in this way, which adds to the feel of the place. And what a place - The Greehnouse has a lovely wooden floor, artfully mismatched furniture, and a small outdoor seating area too. Oh, and a number of strategically placed signs encouraging visitors to switch off their mobile phones. Whether this is for the health of the staff or the general well-being of the customers is unclear, but either way it's another nice touch. The Greenhouse doesn't limit itself to being a tea shop either. 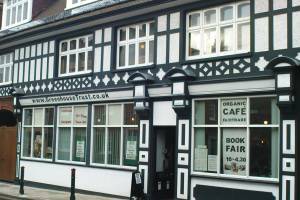 There's a secondhand bookshop upstairs, and a produce shop downstairs selling some of the organic and fairly traded produce that the tea shop serves, and more besides. You can even buy seeds, so that you can go home and grow your own, an activity heartily encouraged by all at Great Tea. And finally, though it's not in your face, there's a rack of information leaflets on all kinds of topics, environmental and political - two that stuck in my mind were entitled "Inquiry into new nuclear power stations" and "Really Mr Huhne?" So yes, this is a place of principle and a place with an agenda, but neither is rammed down your throat. And even if it was, it's an agenda worthy of your consideration and support. As I was getting ready to leave, a small group of protesters came in bearing placards. One read "Curb bankers' bonuses". It's that kind of place. It's where great tea and great principles mix... and it's thoroughly, entirely, utterly and unreservedly recommended. The Station Bistro in Wymondham's historic railway station was formerly known as The Brief Encounter Refreshment Room and Restaurant, then taking its name from the classic David Lean film. Unfortunately, this didn't mean that you were going to catch Celia Johnson and Trevor Howard making discrete comments about their feelings for each other in clipped Cholmondley-Warner English every time you went there. What is did (and still does) mean, though, is that you're going to encounter (see what I did there?) a tea shop with a vintage railway theme and brimming with memorabilia. As it's former full name suggested, the Station Bistro is divided into a refreshment room and a restaurant. The former has walls that are crammed with prints of old locomotives, mostly steam, and other paraphernalia relating to the Norfolk rail travel of yesteryear. The latter is the big draw though - essentially the restaurant is decorated as if it's a train carriage, with authentic, reclaimed train seats to sit on... complete with proper luggage racks overhead. And with windows overlooking the station platform (which, despite the "historic" name is still a functioning mainline railway station, popular with commuters) you could almost be on a train. I suppose I'd better talk about the tea, given the nature of this website. There isn't a lot of choice - English breakfast or Earl Grey. I had the former, and though I had to let it steep for a bit it tasted good (in the end). At least it came in a proper pot, as you can see on the left. It was nicely served too - on the day of my visit the waitressing staff were all very smiley, which makes such a difference. 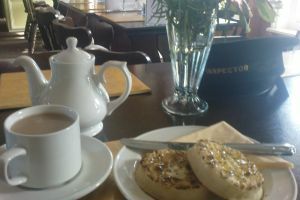 And although the choice of teas might be quite limited (I guess there were no decaff or fruit teas in Celia Johnson's day), the options for what to have with your cuppa are varied: as you can see, I went for the crumpets with mine, and am happy to report that they were excellent. The usual scones (including a cream tea option), sausage rolls, cakes and tea-cakes were also available, and all sounded quite tempting. There's also a reasonable main meal menu which, although pretty standard fare, at least promises home cooked food. Always a good thing. The core ingredients for a good tea shop are all in place then, but it's really the setting and theme that makes Brief Encounter stand out as special. If you're interested in trains, or love the film, or simply just enjoy a bit of general nostalgia, then this is the place for you. Especially so in the restaurant, with the train carriage furniture and fittings. My only quibble is that surely they could push themselves a bit harder and do more with the railway link? Maybe tie in themed meal evenings or link up more with the nearby Mid-Norfolk Railway, which runs steam trains to Wymondham (though not to this station)? Copyright © 2009-2018 Great Tea. Simple theme. Powered by Blogger.